Every year, eight billion tonnes of waste makes its way to the ocean. That's equivalent to the weight of more than two billion elephants standing on top of each other. To solve such a literally enormous problem like pollution, we need to employ some serious creativity and ingenuity. Cue the Seaside Scavenge, an initiative that allows people to trade trash for treasure. 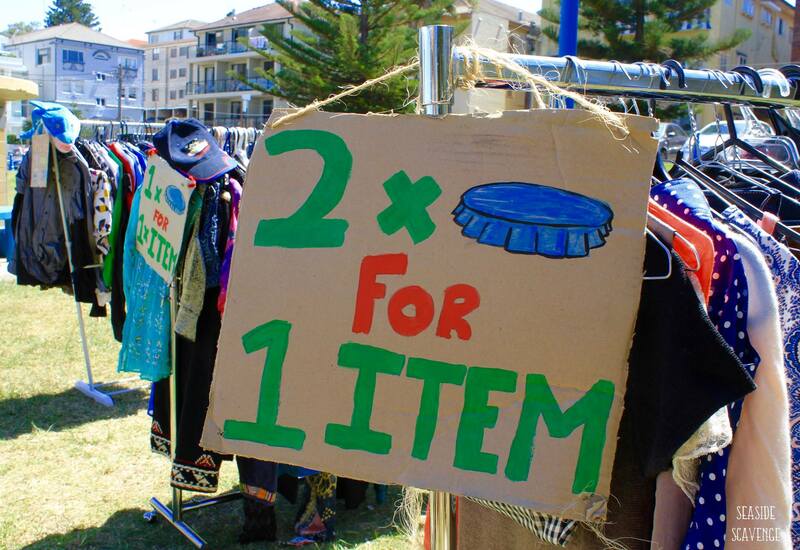 The Seaside Scavenge is a community event that's set up like a market. For every ten pieces of rubbish you pick up, you receive a token. These tokens can be used to 'buy' clothes, old books, shoes and even beer! 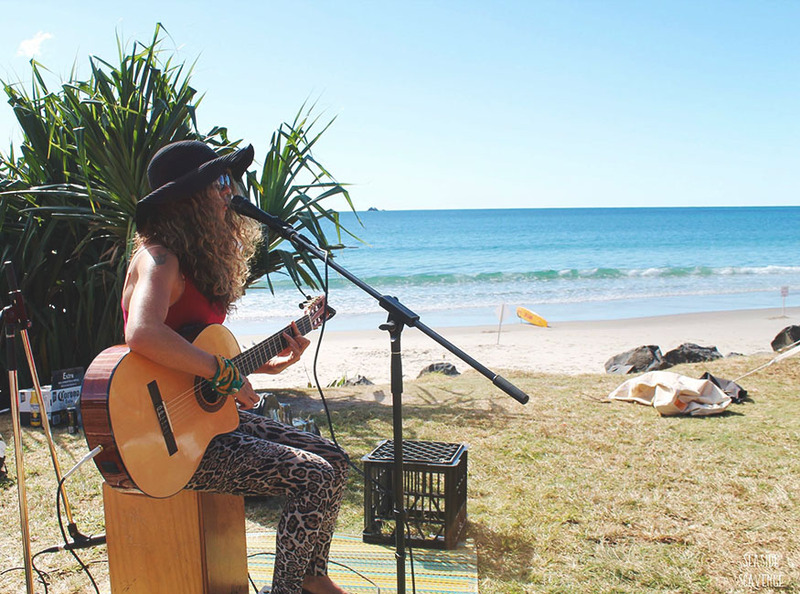 Live music, talks from prominent environmentalists and zero-waste workshops accompany the event, resulting in a wickedly fun day out that entices even the eco-unfriendliest of folks. Engaging people who are otherwise disinterested in environmental issues can be a big challenge. We've become more and more disconnected from nature through our daily activities. This isn't only a huge downer for the planet, but it's detrimental to our own physical and mental health too. By adding value to trash, the Seaside Scavenge is motivating people who otherwise couldn't care less about plastic on the beach to get involved with its removal. 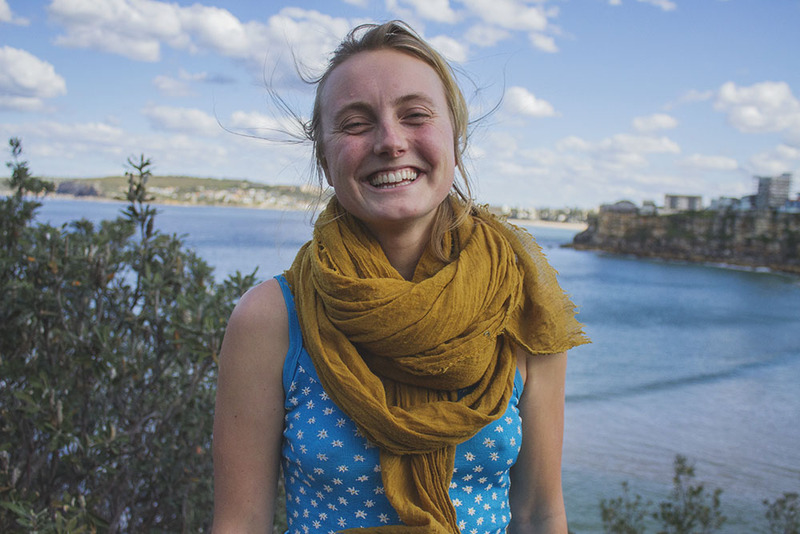 We recently talked trash with Anna Jane Linke, the founder of the Scavenge. When we phoned her, she was speaking from amidst a pile of clothes she was sorting for an upcoming event. What was the catalyst that made you start the Scavenge? Trying to get people involved in a clean up who wouldn't usually attend one. I'd been going to a lot of clean ups and it was great, there always were people coming along. But I wanted a way to get people who didn't know about beach clean-ups and weren't aware of the issue to get down to the beach and clean the litter themselves. What made you become one of those people who were attending beach cleans in the first place? I was living in Chile, there's a lot of litter left in the parks and all around the beautiful spaces like beaches. We started an awareness program there with kids about litter and putting it in the bin. When I came back I wanted to continue doing it, so the Scavenge was born. I've always been pretty aware of litter, since I was really young; I always picked up litter with my Dad on the beach. I found it pretty embarrassing when I was little actually! What was the first step in creating the Scavenge? The idea was that it would be a beach clean and a clothes swap at the same time, so that was the base idea. I started talking about it with friends and how it could be done; it was about growing the idea and building support within my group of friends. I found who would be keen to help out, and I grew my network. I had a few meetings with friends of friends who were entrepreneurs about how to get started, so I was using my network to find out how to do get the Scavenge off the ground. For those that have their own ideas for events or initiatives with a positive environmental impact, what's your advice for taking it from daydream to reality? I'd suggest finding a team of people to do it with. If you find an idea you have to find people to help you, you can't do it yourself. It's just about talking about it. Don't be shy to chat about talking about your passion project with whomever you come across! You never know who has a contact or an idea that might be able to bring it to life. "Don't be shy to chat about talking about your passion project with whomever you come across! You never know who has a contact or an idea that might be able to bring it to life." What's your best tip for avoiding waste in your everyday life? Be prepared. Don't leave shopping until the last minute, particularly with food. Always have something in the cupboard so you don't have to buy stuff wrapped in plastic. What's on the cards for the Scavenge in the future? At the moment we're currently setting up Chapters of the Scavenge around Australia. A Chapter is basically a branch of the Scavenge run by the local community. So far we've successfully got Scavenges running independently in Mornington Peninsula, Port Macquarie and Townsville, with Perth joining the list later in the year. We're also trying to engage the corporate sector with waste awareness and single-use plastic reduction in the workplace. So if there's any businesses keen to cut down their waste, please get in touch! How do you juggle running your own Not-For-Profit with work? Since 2017 I've managed to turn the Scavenge into my job. It's definitely not a lucrative line of work, but it pays the bills. And money or passion... what would you chose?! What's been your best response from The Scavenge so far? Half an hour later they come back with 140 pieces of litter and they're blown away by how much stuff there is on the beach. That's what we want; we want to open people's eyes in a really enjoyable way. Learning the bureaucratic side of organising public events in public spaces. Although the intention is good, and there's no personal or financial gain, it's still so difficult to do anything without permits or insurance, which all require charity status. It's been challenging getting the scavenge to a point where it can run efficiently as a stand alone initiative and get councils on-board. What's the largest amount of one particular item you've found? 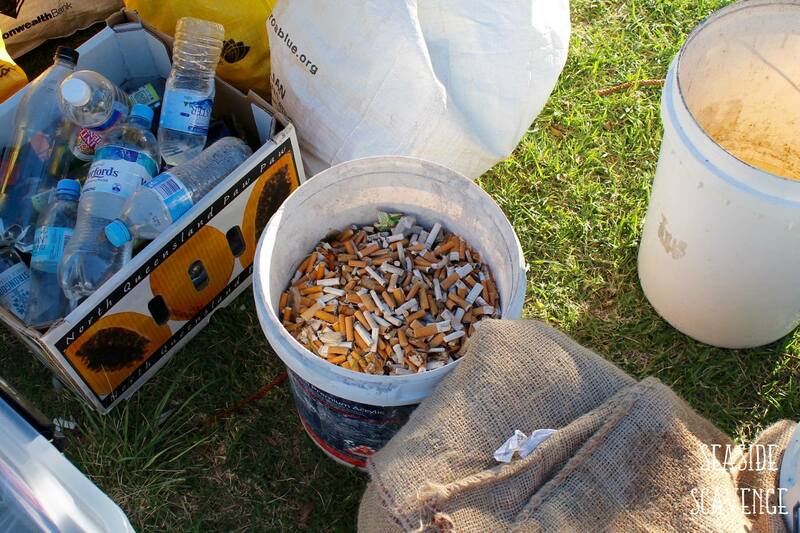 We once found 7400 cigarette butts in one event! What are the items that you find the most? Cigarette butts! There's loads of straws and Chuppa Chup sticks, but there's always so many cigarette butts. Are you open to people hosting Scavenges in their own community? We would love that! There's a guide on the website. You can get in touch with us via the contact page with questions or if you need support. We're looking for groups, businesses and individuals who want it to happen in their area, so get in touch!